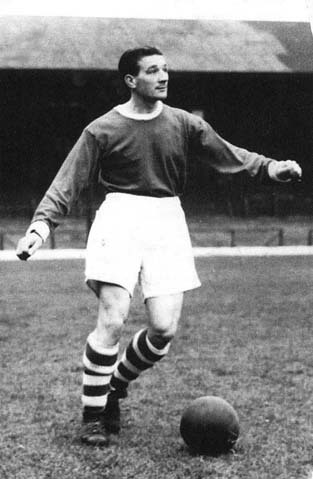 Bob Paisley had won several admirers in the press for his dogged displays: "Left half is where he shines and this season his dour, bulldog-like displays have made him a great favourite. Has won a regular place by sheer dogged tenacity, keen tackling and tireless energy. Is one of the best throw-in experts." If the success of 46-47 had been a heady one for Liverpool, the following years were something of an anti climax for the club. A poor start to the 1947-48 season, coupled with a disastrous new year run, saw the team languishing in mid table come the season end. At one point, in early March, the unbelievable threat of relegation hung around Anfield. Paisley, by now firmly established, played 37 times and scored 1 goal. Strangely enough the goal came in the final league match of the season, again against Wolves. Season 48-49 followed a similar pattern with Liverpool finishing 12th. For much of the campaign they had to do without the injured Stubbins and relied heavily on Balmer and the wing wizardry of Liddell. However, by the time December 1949 had come round, Liverpool were seemingly marching on to new glories as they ripped through the first 19 league games of the 49-50 season unbeaten. It set a new record in English football (broken by Leeds Utd in 1973-74). Unfortunately, after losing their first game of the season to Huddersfield on December 10th the wheels began to come off the league campaign and attention turned instead to the F.A. Cup. Liverpool had never won the cup in their history yet expectation began to mount that maybe 1950 was to be their year as the club marched confidently through to the semi finals after dismissing Blackpool 2-1 in a quarter final tie at Anfield. Neighbours Everton provided the opposition at Manchester City's Maine Road in front of 73,000 spectators, and in an epic contest, Liverpool ran out 2-0 winners with Paisley netting the opening goal after 29 minutes. Billy Liddell added another in the second half as Liverpool celebrated their first cup final qualification since 1914. "Even now I cringe a bit when I think of it, not just because we lost 2-0, but because I lost my place. When people talk of their darkest day this was mine. I read that I wouldn't be playing in a newspaper, and the bottom fell out of my world. I had been a regular and playing well. I scored one of the goals that helped to beat Everton in the semi-final. Then tragedy struck. I got a knee injury. "We had two international centre-halves, Bill Jones and Laurie Hughes. Before the final they were both chosen for England, one in the "b" team, and I expect that put the directors under some pressure. I was never big-headed and had never taken it for granted that I would be picked, but it was a knockout blow all the same. Wembley was the event of the season, probably even more than it is today. Anybody who could kick a ball wanted to kick it at Wembley. "I was offered what was big money in those days to pour out my heart to a newspaper. Thankfully I thought the better of it. I suppose it taught me a lesson that first thoughts are not always wisest. Often it is better to sleep on a problem. That was the only occasion in my lifetime when I was disenchanted with Liverpool. I have lived to bless the day when I bit my tongue and said nothing. I didn't want to move really." I would choose Paisley, Forrest (Bolton), and Shankly (Preston)." From a newspaper cutting - Paisley already being mentioned in the same breath as Shankly! Football, as someone once said, is a funny old game. After the awful disappointment of missing out at Wembley just months earlier, Paisley was to play 41 of the 42 league games in season 1950-51, but Liverpool were now set inexorably on a downward spiral. George Kay stood down as manager in February 1951 through ill health and was replaced by Don Welsh, but the decline was gathering pace. In the following three seasons Liverpool finished 9th, 11th, and 17th. Relegation to Division 2 was avoided only on the last day of the 1952-53 season when the Reds were roared to a 2-0 win over Chelsea in front of 47,000 at Anfield. Inevitably, at the end of the 1953-54 season, Liverpool crashed to the Second Division after finishing bottom of the first with just 28 points. Amazingly they somehow managed to score 68 league goals, more than 10th placed Cardiff managed but leaked an incredible 97 at the other end, the worst tally in all four divisions. To make matter worse, Everton gained promotion from Division 2 as runners-up to effectively replace their deadly rivals. It was not a great time to be a Liverpudlian. 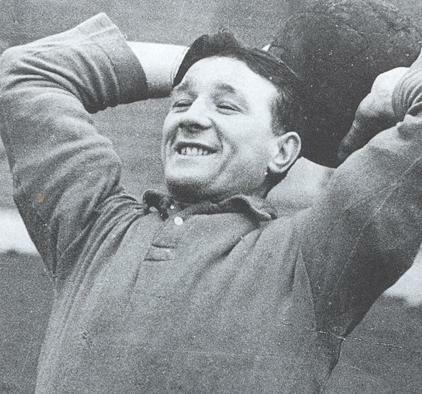 Bob Paisley was 35 years old and on 4th of May 1954 it was made public in the Liverpool Evening Express that "Bobby Paisley, the tough little North-Easterner who specialises in the long throw and is of the never-say-die order," was not on the list of of retained list of players for the coming season. Paisley gave serious thought to going back to his brick laying trade. "Paisley went in, was beaten, then had the temerity to go back for more. The result was that Matthews, who had left him yards behind, suddenly found the second tackle the lethal one. Matthews mesmerised Lambert, but he did no such thing to Paisley." A newspaper cutting on the battle between Sir Stanley Matthews and "Sir" Bob Paisley in a Liverpool v Blackpool game. In one of those decisions that seem inocuous or mundane at the time, the Anfield board offered the newly retired Paisley a job on the back room staff. He had impressed everyone over the years with his analytical mind and had taken the time to study a correspondence course in physiotherapy. It was the start of a new era. "Bob Paisley, brilliant Liverpool left-half, first saw the light of day in the little Durham mining village of Hetton-le-hole. There isn’t a great deal of him - he is barely 5ft. 7 inch. in height – but is includes 11 st. of muscle and never-say-die spirit. The lad who never knows when to be beaten, Paisley took the eye of his games master as a natural footballer, and it was not long before he was rewarded with a place in the Durham County Schools’ side. Eventually, threw in his lot with with Bishop Auckland, the famous amateur team. They won the Amateur cup during his stay with them. Later he joined the ground staff at Wolverhampton under Major Frank Buckley, but he decided Paisley was too small. Manager Mr. George Kay, stepped in and brought Bob to Anfield. The war intervened and Bob joined an anti-tank regiment and served from Alamein to Italy with "Monty". It was during last season he grew into his own and made a regular place for himself in the Championship team. There is no greater-hearted player than Bob Paisley. He seems to thrive on hard knocks. Likes billiards and snooker, admits to "bowling a bit" at cricket. Wants a cup winners’ medal to add to his Championship "prize". Distantly related to Jack Hill, former Barnsley "pirot" and England captain. Married a Liverpool girl."